- 30 years of RC Experience has taught us that keeping a clutch cool and clean means less maintenance and frustration. 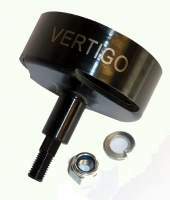 - Vertigo's ever popular vented steel bell now comes with larger vents at the side/face, not holes in the face that can collect dirt. We increased the 6mm threaded shaft to a 7mm threaded shaft for even greater reliability. - Access holes to adjust clutch should you be running an Elcon Performance clutch. * Requires use of 17t, 18t, 19t or 20t Hex drive pinion gears.